IF the front door is locked, you use the back door. But if the back door is also shut, you might have to use a side door to get in or climb through a window. The same could be said of companies seeking to list — either via an initial public offering (IPO) or indirectly through a reverse takeover (RTO), which is sometimes referred to as a back-door listing. If a company does not meet the requirements to go public via an IPO or RTO, it could explore an alternative option — buying into a listed company that eventually acquires the new shareholder’s privately-owned businesses or assets. Last October, The Edge reported that over the last couple of years, there had been an increase in the number of public listed companies diversifying their business after being taken over by new shareholders, without triggering the strict regulations governing an RTO. 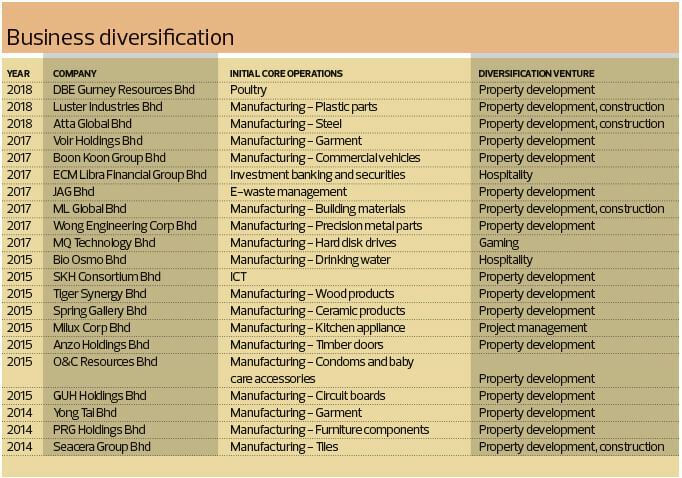 The targets of these exercises seem to be mostly in the manufacturing sector, with property development as a choice diversification venture (see table on Page 48). 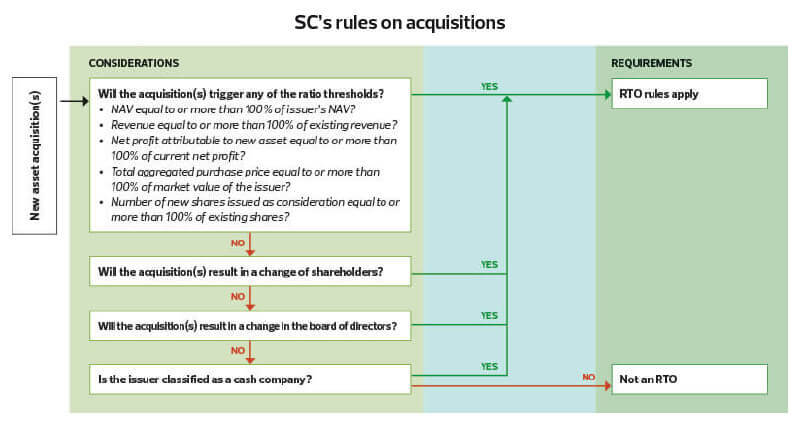 Although these exercises might seem significant due to the material contribution expected from the new ventures, and sometimes the entry of a new major shareholder, they did not trigger Bursa Malaysia’s and the Securities Commission Malaysia’s (SC) rules governing RTOs. The trend is gaining traction on Bursa. Prominent businessmen continue to shop around on the stock exchange with the intention of injecting their privately-owned businesses and assets into listed firms and giving these mostly ailing companies a new lease of life. Perak-based poultry firm DBE Gurney Resources Bhd is venturing into property development with the emergence of Doh Properties Holdings Sdn Bhd as a substantial shareholder. Doh Properties is the vehicle of the Doh brothers — Datuk Doh Jee Chai, Datuk Marcus Doh Tee Leong and Datuk Jimmy Doh Jee Ming. The brothers are the sons of Datuk Doh Neng Chiong, a prominent businessman from Sitiawan, Perak. Another example is Boon Koon Group Bhd, a Penang-based manufacturer of rebuilt commercial vehicles, which saw the emergence of Datuk Seri Chiau Beng Teik as a substantial shareholder in April last year. Beng Teik is the founder and deputy executive chairman of Chin Hin Group Bhd, a homegrown building material specialist. Similarly, Boon Koon is diversifying into property development by partnering Aera Property Group Sdn Bhd, which is controlled by the Chiau family. Tan Sri Richard Koh Kin Lip and Liew Fook Meng — long-time business partners at Cocoaland Holdings Bhd — have become substantial shareholders of SCH Group Bhd — the ACE Market-listed quarry machinery and equipment supplier — after acquiring substantial stakes in March last year. Two months later, Liew was appointed a non-executive director. In March this year, Koh and Liew emerged together as substantial shareholders in office furniture maker Euro Holdings Bhd. It remains to be seen what Koh and Liew can bring to SCH and Euro Holdings, but Koh is said to be a client of SCH as he owns quarries and river sand concessions in Sabah. So, there may be synergy between the company and his quarries. Interestingly, SCH is continuing to bring in prominent names as new strategic investors, including Datuk Ong Soon Ho and Datuk Eddie Ong Choo Meng, who are the directors of Halex Holdings Bhd. Three months ago, SCH announced its intention to diversify into the event equipment supply business, by acquiring TK Tent & Air-Conditioning Rental Sdn Bhd from Hextar Holdings Sdn Bhd, the Ong family’s private vehicle, for RM50 million. Meanwhile, it is learnt that over the last 10 years, the Ongs have tried to list Hextar’s agrochemical unit on Bursa Malaysia and the Hong Kong stock exchange via an IPO. It is also rumoured that the father and son wanted to inject the agrochemical business into Denko Industrial Corp Bhd. All three attempts failed. But, eventually, they found a way. Last year, Hextar became the controlling shareholder of Halex, before the listed vehicle was used to acquire Hextar Chemicals Ltd for RM550 million. Of course, these deals are not structured in exactly the same way. But one cannot help but ask why didn’t Doh Properties, Aera Property, Hextar Chemicals and TK Tent take the IPO route or a back-door listing? Simply put, the business diversification route can be more simple but it is time-consuming. A senior corporate adviser acknowledges that many businessmen are choosing the business diversification path nowadays because the RTO rules are too stringent and it involves a lot of regulatory approvals. “The market has to survive. People who are stuck with assets and land must find ways around these over-stringent regulations before they can inject them into the listed companies,” he tells The Edge. One might argue that the RTO rules have to be strict to protect the interests of minority shareholders. But the regulators need to strike a balance between corporate governance on the one hand and the need for entrepreneurs to tap the capital market on the other. The corporate adviser recalls that after the Asian financial crisis in 1997/98, regulators allowed more lenient RTO rules that white knights could take advantage of to rescue ailing companies. However, as things improved over the years, with fewer PN17 companies on Bursa, the regulators slowly began to tighten the RTO rules again. “It has come to a point where it is extremely tough to undertake an RTO. You either go for an IPO or you try to do business diversification. The threshold for an IPO should be the highest but now the threshold for an RTO is as high as an IPO, so nobody wants to do that,” he says. A veteran stockbroker concurs. “Not every business diversification is an RTO, but there will be some. Obviously, avoiding an RTO would make your life easier. If the RTO involves the exchange of shares, you might end up triggering an MGO (mandatory general offer). The trigger can come from buying a block of shares from the existing owner or it can come from the injection of assets,” he explains. Considering that some privately-held assets might not qualify for listing via an IPO, while the RTO rules are almost as strict as for an IPO, some quarters see this as a high barrier for companies, particularly small and medium-sized businesses. A company’s financial controller highlights that there is nothing wrong with bypassing the RTO rules if a white knight has the potential to revive a company by injecting new business into it, as it will benefit the minority shareholders. He says an IPO is slow and the RTO route is slightly faster, but it is still a lengthy process as companies need regulatory approval. “If you ask me, the process is more or less the same. As long as you need approvals, it will take time, so it is always preferable to avoid an RTO,” he says. The corporate finance head of a local stockbroking firm appears annoyed by the phrase “avoiding an RTO”. He points out that some business diversification plans are not an IPO or RTO at all, but the businessmen are buying into listed companies and using them as a platform to raise capital or participate in a new business. “If I find a good business or spot a deal, I want to use the listed vehicle to execute my plans. I don’t think this is a case of people avoiding an RTO. Bursa rules are very clear, if I have the money, I can buy into a listed company. If I buy less than 33% equity interest, I don’t have to do a general offer. This is a takeover, it was never an RTO,” he says. The head of corporate finance, however, concedes that taking the RTO route is a challenge as the company to be injected needs to meet listing requirements similar to those of an IPO. “The thing is, if I have the track record to do an IPO, why should I go for an RTO? What is the benefit to me to do an RTO if I can go for an IPO? Why should I team up with you (ailing company) and carry your legacy? That’s why nobody wants to do RTOs nowadays, because there are more benefits to an IPO than an RTO [on Bursa],” he says.